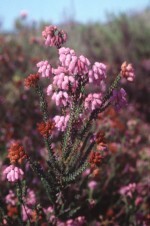 The Heather Society	| Erica andevalensis f. andevelensis : corolla dark pink. Erica andevalensis f. andevelensis : corolla dark pink. Pink flowers; XI-I; foliage grey-green; habit loose open, height 100cm spread 75cm. Flowering is unreliable in a northern European climate and it's hardiness is suspect. Of botanical interest.